Hammer have been a firm staple of British horror on and off since the 1930s. Their recent revival continues with this adaptation of Susan Hill's 1983 novel 'The Woman In Black', already adapted tremendously successfully for the stage. The film adaptation has also begun successfully, topping the UK box office, despite mixed reviews. Arthur Kipps (Daniel Radcliffe) is a single father, whose wife died in childbirth, and is tasked with handling the affairs of the estate of the now deceased Alice Trablow in the North East of England. The local villagers are reluctant to talk about the family and estate, and it soon emerges that the area is haunted by the wronged sister of Trablow - the eponymous woman in black. Billed as the "most chilling ghost story of its time", my experience of 'The Woman In Black' was far less impressive. Had I not been charged with reviewing the film in the iconic setting of the VAULT festival, I would not have seen this - I am immensely susceptible to being terrified. Yet 'The Woman In Black' failed rather miserably in this aspect. The odd moment proves suitably scary although whether this feeling is actually one of fright or merely being startled is a matter of debate. Regardless, the lack of a sense of foreboding is of more importance. Director James Watkins rarely succeeds in delivering chilling scenes, hindered by Jane Goldman's mediocre script. The film suffers from an all-consuming blandness, whereby the plot plods along with little mystery or intrigue, despite ample opportunity. This blandness extends to the unremarkable acting. Daniel Radcliffe finds himself in the depressing dichotomy of looking sad or scared throughout the entire film. The villagers too, barring Ciarin Hinds and Janet McTeer, are left looking either terrified or angry depending what day of the week it is. 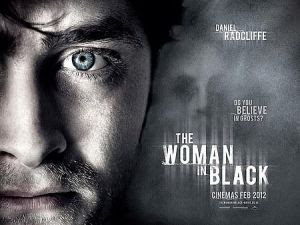 'The Woman In Black' is forgettable. A surprising and all the more disappointing conclusion considering its firm standing in British horror history. Aspects of the film do stand out, such as the production and costume design, but these do not hide the central blandness that dominates the entire film. Gloomy, for more than one reason. 'The Woman In Black' is on wide release throughout UK cinemas now.